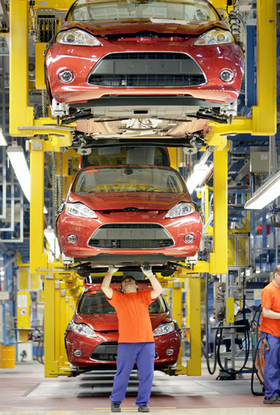 Ford of Europe will introduce short-time working and cut production at its two car factories in Germany. "We are doing this because our major markets of Spain and the UK are going down dramatically," a Ford of Germany spokesman said. Both Saarlouis and Cologne export about 80 percent of their production. About 12,600 workers will be affected by the production cutbacks. All vehicle lines at the two factories will be affected. Ford builds the Fiesta small car and Fusion small minivan in Cologne and the Focus lower-medium car, C-Max medium minivan and Kuga medium SUV in Saarlouis. Ford will discuss the amount of short-time working and how long it will last with unions next week. "We must adapt our production to demand. The duration of the short-time work depends on what happens in the market," the spokesman said. Ford has already agreed with unions to have four non production days at its Cologne engine plant in January and February.